Turns out the Irish capital is all kinds of cool. Here's where to eat, stay and explore. Maybe I’m late to the party, but I had no idea Dublin was such a cool city until I made my recent pilgrimage. In celebration of it’s coolness, I’ve rounded up a list of all my favourite spots. 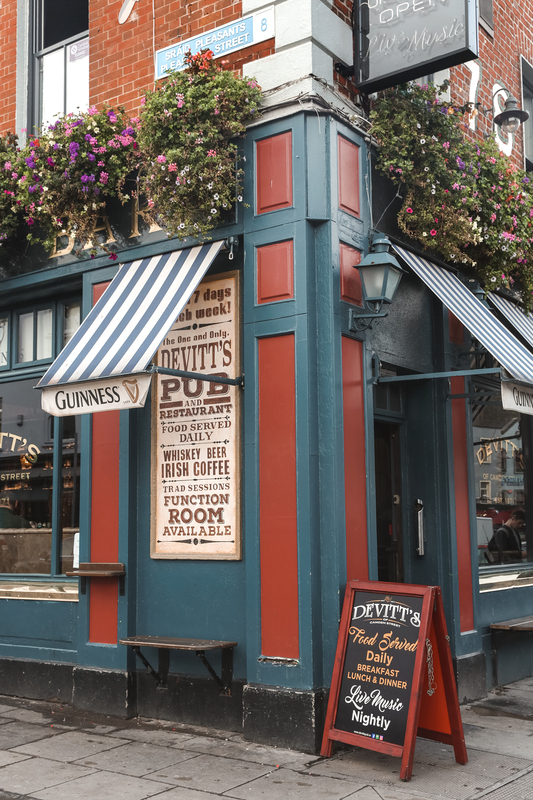 After our Irish road trip (aka the road trip to end all road trips), Sam and I spent a few nights in Dublin, a city – in all on fairness – that I didn’t know a whole lot about. It’s not like anyone had ever suggested Dublin wasn’t worth exploring, but nor had anyone suggested it was a city I should drop everything and visit. And I have to say, Dublin deserves way more props than it’s given. The restaurants and cafes rival London, minus the queues and moody vibes. There are so many incredible vintage and antiques stores, I almost (almost) don’t want to let you in on the secrets. Plus the people are funny (not making fun of the accent, promise!) and there’s plenty of great drinks on tap. So we spent three days attempting to try out more cafes and restaurants than there were meals in the day, and seeing as much of the city as we could by foot (despite the rain). This is by no means a definitive guide; it’s more like a quick introductory guide to a city that’s more than worthy of your travel hit list. Go antique shopping for pre-loved jewels and chic homewares, and rummage through the vintage stores and charity shops for pretty much anything your heart desires. If you like antique jewellery, Dublin’s got your back. Sam picked up some super cool vintage Hawaiian shirts (in all honesty we visited so many charity stores and vintage shops it would be a little ridiculous to list – just search ‘vintage store’ on Google), and I got two really beautiful necklaces from Monte-Cristo inside the Powerscourt Centre. For gram-worthy breakfasts that taste even better than they look, Meet Me in the Morning was so good I went back two mornings in a row. An interesting with a focus on fresh ingredients, plus good coffee. What more could you want. For homemade food that’s as healthy as it hearty, make sure you head to The Fumbally. The warehouse style cafe is open for breakfast and lunch daily, as well as dinner per week. The open space is filled with newspapers, comfy chairs to lounge in and a neighborhood vibe so friendly you’ll find yourself considering a move to Dublin. At The Wilder, a newly-opened hotel which I chanced upon online and ended up being the perfect locale for a city stay. Chic interiors (aka highly Instagrammable). Quiet rooms. Slick bathrooms with the kind of skincare products you wish you had in your own bathroom. And within walking distance – or a quick cab when it’s raining – to all the best restaurants and cafes. You wouldn’t think you’d go to Dublin for Indian food, but Pickle Restaurant served some of the best Indian I’ve ever had. Pickle offers up seasonal, thoughtfully prepared Northern Indian fare, and although it’s not the cheapest meal you’ll ever have, the servings are generous and it’s worth every penny. Head to Delahunt for an original, refined take on traditional Irish food. Make sure, before you sit down for a meal, to head upstairs to their secret bar (ring the bell on the blue door), for cocktails and a cheese platter. See a live comedy show. There are few better ways to spend a night than howling with laughter, and as we know, the Irish know their humour. We went to The Comedy Crunch; check who’s on the bill for that night at all the venues (as there’s several) and make your decision from there. Visit The Long Room at Trinity College. Yes ,the fee to enter feels pretty steep – we almost didn’t go in, as we figured: really how good can a library be? Turns out, good. Learning about how some of the world’s oldest books were created is pretty mind-blowing, as is walking through the impressive library itself.